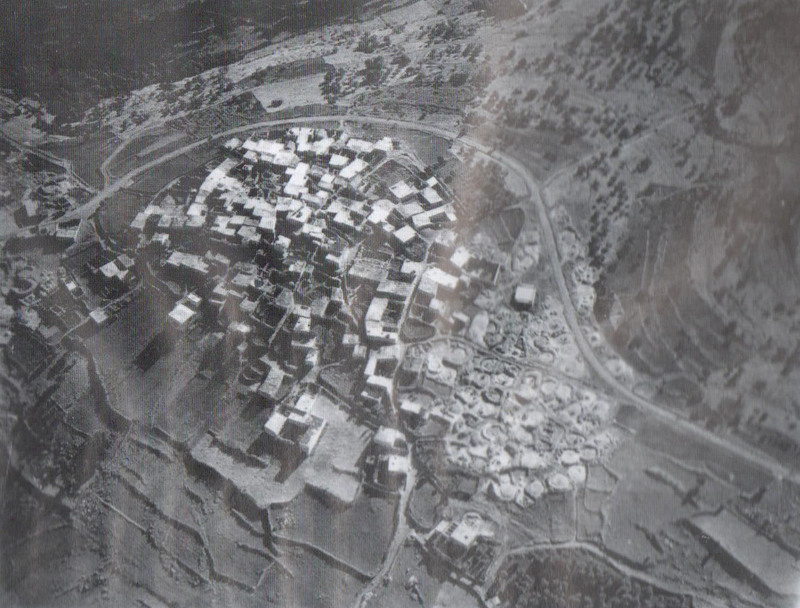 In Ariella Azoulay's appropriated photograph of the Palestinian town of Kufr Bir'im, loaned to her by Nahida Zahra, a second-generation refugee, she provides the above caption as a counter to the official Israeli version of events. The landscape appears pock-marked with open, circular spaces to the right of the city centre, where stacks of white cubes are interconnected and seemingly built one upon another. A line snakes around the perimeter, demarcating the space between Kufr Bir'im and the surrounding hills, intermittent trees, fields differentiated only by the subtle shades of grey in this black-and-white photograph. In the image, the inhabitants of the village are invisible, and intended to remain that way. One need not - should not - think of the people occupying these spaces. Everyday human life is abstracted into a series of blocks, passageways, and potential targets. Time to think, to consider one's actions, is diminished. While Azoulay is careful to specify the exact circumstances of this image - the evacuation of Kufr Bir'im's inhabitants and deliberate erasure of its architecture - the aerial military photograph is loaded with insinuations, and expectations, of overhead assault. The surveillance plane is a precursor to the bomber, relaying the preliminary information required to assess and determine possible targets while, at the same time, capturing only the formal, surface qualities of the cityscape. The photograph implies an objectification and dehumanisation of the inhabitants below, akin to the linguistic terminology that Grossman rightly identifies, where 'signature strikes' refer to attacks on individuals or groups who meet certain, unspecified definitions of enemy combatants and 'bug splat', rather than 'collateral damage', stands for unintended civilian casualties. These euphemisms act as a corollary to aerial bombardment, a mode of distancing and abstracting the reality below. "The Arab Israeli citizens who were expelled from the village still live nearby today. Had the rights stemming from Israeli citizenship not been applied differentially to different sectors of the population, they would long ago have obtained redress and compensation. This contextualisation doesn't necessarily offer that, but it does close in on whom exactly lives within the image. A lot of people ask around how they can send authentication messages like OTPs or verification codes whenever someone registers an account on their website or application. The simple answer is that they need to connect their application with an SMS provider using an SMS API. You can completely acquire proof and hand it over to cops. There would be chain of authority issues of changing degrees relying upon the sort proof 24HWriteMyEssay, yet this is something PI's do frequently. For this situation it would be utilized for the protection which have considerably more breathing space in such manner. The fringes aren't formally set, and Do My Homework Free numerous regions guaranteed by Palestinians have been involved by Israelis for a considerable length of time. In excess of 135 United Nations part nations perceive Palestine as a free state. The 192.168.l.254 IP address often used by routers as their default gateway, is a private internet protocol address, allows users to gain access to the router’s control panel. Very interesting post! Thanks for sharing. This is the main reason why most students search for online assignment help Australia over the internet and choose only the most proficient and trusted academic writing experts. Law assignment help Australia in understanding how legal theories and concepts can be enforced in the real world. Assignments in the subject of engineering could vary from a dissertation to an essay. This is where engineering assignment help comes into picture. You can see the way that our assignment help Pakistan experts write an answer and learn how we will help you in writing your assignment solution. Australian Assignment Help delivers best quality marketing assignment help in Australia at reasonable rates to its students. Hire a professional writer who has to gives best quality work help to the student. We have many experts writers. who are serving to the student by its best writing service. Our expert writers are online 24*7 hours for essay help uae. Allassignmenthelp provides online Assignment help services to students across the world by its top class professionals with highly effective data. There are lots of assignment writing services and a lot of assignment service agencies in the UK. But students assignment help is the best in all. It offers the world's best my assignment help UK service to the students of the UK. At my assignment help, the students can get support on any analysis assignment topics. Before writing these assignments, the students must develop an in-depth knowledge on the subject which they are going to analyze. But in most of the situations, the students do not know how to do my assignment and also do not have firm knowledge about the book, film or novel which they are going to evaluate and end up preparing a paper below the expectations of their professors. These essays require logical reasoning, objective writing and a personal touch. The PhD qualified assignment help experts at Essayassignmenthelp.com.au can prepare the papers just according to the need and requirements. Hey, Your blog is very informative. It is nice to read such high-quality content.For assignment help go for myassignmenthelp.com. For more information related to do my arts architecture assignment.